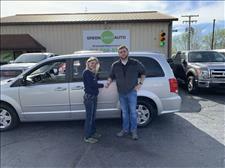 I have the best van ever thanks to Green Light Auto!!! Its exactly what I was looking for! I couldn't have done it without Green Light Auto! I love my truck, and they were great! I had a lot of fun with these guys, they eve let me go pick my daughter up from work to surprise her! Down to earth, good people! Ill buy again. I was very pleased with Green Light Auto! they stayed over late to help me and communicated great with me through out the whole process. Green Light Auto had many different cars for me to try out! I didn't just want the first car I sat in and they REALLY did work with me! I would recommend them 10/10. They were very open and friendly! Debbie is a tough pickle to negotiate but we came to an agreement and I'm very pleased! Found the best bang for my buck!!! 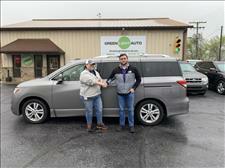 I love my new van! Thanks guys! I had so much fun! They let me sit in 4-5 vehicles, get comfortable and really find what I liked. No pushy salesmen, just good quality people! Id buy again. 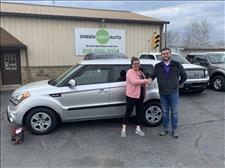 I came in needing a more dependable and much larger vehicle for my growing family and Green Light Auto was able to help me! Zeb showed me many great options and Debbie was quick with the paper work. Zeb and Debbie are the best!!! I love my CRV, could not of done it without them! 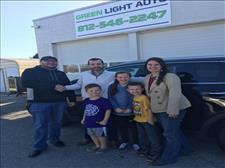 Green Light Auto is a great family business! they were able to work with me and get me what I wanted! Thank you so much! 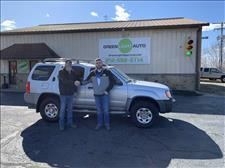 A+++ service from the guys at greenlight auto! Stayed well past closing time to get my deal done. 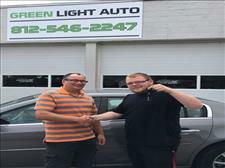 Green light auto is well maintained and awesome. 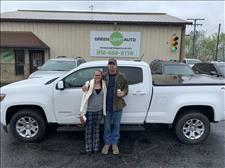 Derek has taken great care of me and my family on vehicles..
Derek Elkins at Greenlight Auto has always done his very best for my family and friends getting all of us in a vehicle of our choice. 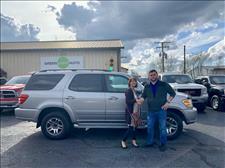 He's a very outstanding young gentleman one I would recommend visiting for a new used Car or Truck. Derek took great care of us! We came in to look at an 07 and wound up with an incredible deal on an 09! Will definitely recommend!  Whether you're looking for a car, truck, van or SUV Derek is the guy! He isn't just trying to make a buck he really cares about the needs of his customer! 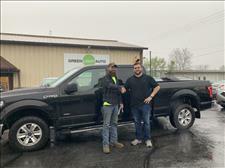 I always trust him to sell me a great vehicle for a great price! Done a great job helping me with purchase of my wrangler! 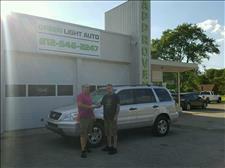 Derek was of great help with buying our 05 Honda pilot. It was an overall great experience and I would recommend to anyone! 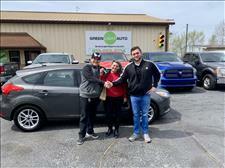 Derek and Zeb were awesome while helping me find a new car! They were friendly, let me try as many as I wanted and were never pushy like all the other places I went shopping. 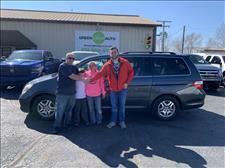 I highly recommend Green Light Auto if anyone is shopping for a new car! 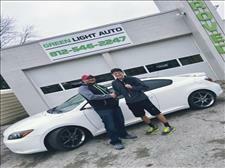 I had such a great experience with the guys at Green Light Auto. Derek, Zeb and Bruce were wonderful to work with. They are genuine, transparent and friendly - and their aim is to find the right vehicle for you. They are a fantastic new business here in Hope. 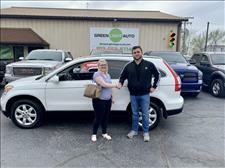 Beyond selling cars, they are doing a good job connecting with people in our community and making a positive impact! I am extremely satisfied with the new vehicle they found for me. 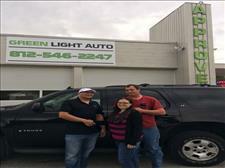 Without reservation, I gladly endorse Green Light Auto! At Green Light Approval we are proud of the quality used cars we sell and our dedication to serve the needs of our customers. This is reflected in the amount of repeat business we receive. 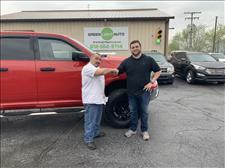 Whether this is your first purchase with us or one of many that you’ve had, you can count on our dedicated sales staff to make it the best buying experience possible.